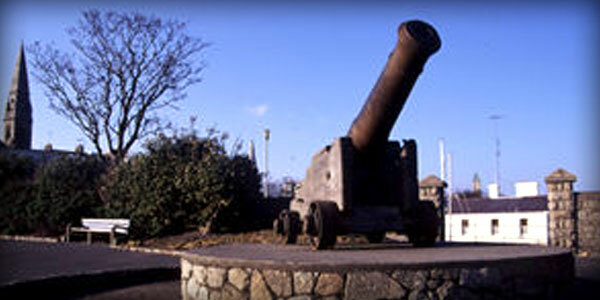 Did you know that the gun at the East Pier gardens is a trophy from the Crimean War? 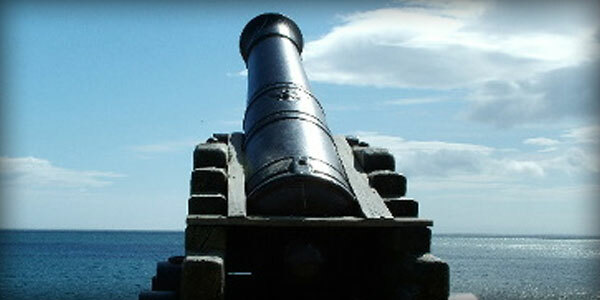 The cannon at the East Pier gardens is a familiar landmark, an object for children to clamber over and fire at imaginary pirate ships in Scotsman’s Bay and part of the spoils of the Crimean War. According to the Kingstown Town Commissioners minutes of July 17, 1857, 16 pounds was raised from the townships rates for the purchase of one ‘Russian gun’ from the Secretary for War, Lord Panmure. The 24 pound gun arrived and was placed on a carriage that had been made at the Royal Arsenal in Woolwich, London. The gun was originally on displayed at a platform along Queen’s road, near to the Baths site. When the road was widened the cannon went into storage for 40 years and in 1974 it was put back on display at its present location at the East Pier gardens. The Russian gun was one of nearly 3,000 that were captured during the Crimean War. 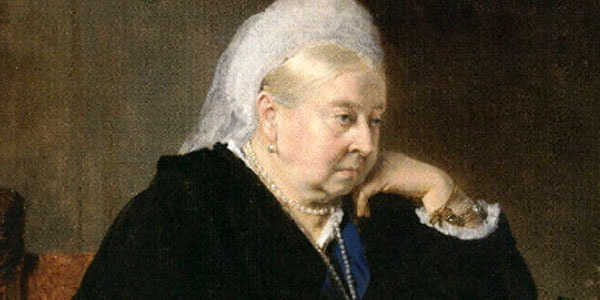 Most of them were reportedly from the siege of Sebastopol – due to public discontent with the management of the war it is suspected that these numbers were exaggerated in order to show why the siege took so long. In the Treaty of Paris, which ended the war, it was agreed that each of the victors would receive cannons from the Russians as trophies of their victory. Some of these Russian guns were put on display in towns throughout Britain and Ireland. In Ireland over 20 towns are believed to have applied for and received a Russian gun for display. You can see the double eagle and crown of the Romanov family crest on the cannon today. Article reproduced with permission: Dun Laoghaire Rathdown County Council in particular the Heritage Officer – Tim Carey Reproduced from: “Did You Know”. “In recognition of the immense contribution of those who built Dún Laoghaire Harbour between 1817 and 1842, the Dún Laoghaire Harbour Company is proud to dedicate the new public space created around the restored Victorian Fountain to the memory of these largely forgotten workers. 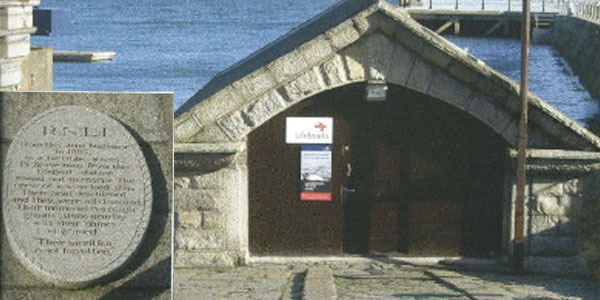 “I am very pleased that the Dún Laoghaire Harbour Company has taken this initiative to recognise the workers who built the Harbour nearly two hundred years ago. 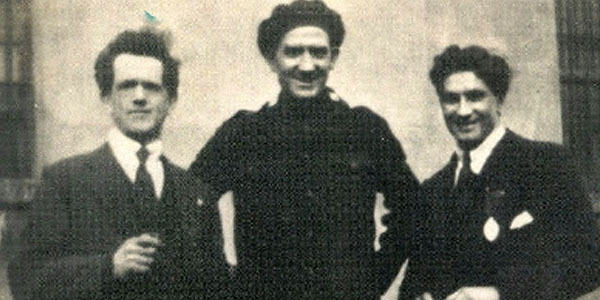 At a time when Dublin Bay was treacherous,the men who built the Harbour took risks with their lives so that others at sea might be safe. 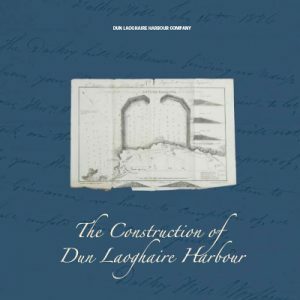 The Booklet “Construction of Dún Laoghaire Harbour” is now available to download from the web site. Click image below. When the Irish Parliament voted £21,000, in 1755, to the construction of a harbour at Dúnleary (as it was then known), the village was no more than “the inconsiderable and dirty abode of a few fishermen, in the bottom of the valley”. In 1944 a diaphone fog signal was installed (figs 32 & 33), consisting of a piston driven by compressed air. In July 1968 the East Pier station switched from vapourised paraffin to electricity, and became unmanned. The new candle-power was 226,000. Although hobbling is described in the Oxford Dictionary as “unlicensed pilotage” the hobblers of the East Coast were only involved in tying up the ships at their moorings in Dublin and other Ports. However, on occasions they did pilot some ships into harbour. Many of the hobblers got the approximate time of arrival of the ships from Lloyds Gazette, while others went out in the bay in the hope of sighting a ship. Hobbling is an old occupation and in all probability goes back to the early decades of the 19th Century when Hutchinson was made Harbour Master of the New Royal Harbour of Kingstown. By the 1940’s it had died out as an occupation. This short article was written to the memory of those brave hobblers who lost their lives at sea. May they rest in peace. You can download historical documents to print off or save and read offline. These documents are in either MS Word, or PDF file formats and are provided here for your information. There is a visual ferry gallery showing the many of the ferries that have been deployed upon the Dún Laoghaire to Holyhead crossing. The photographs are provided courtesy of Justin Merrigan, who has provided the web site with a personal insight to “My Dún Laoghaire Harbour” which you can read here. 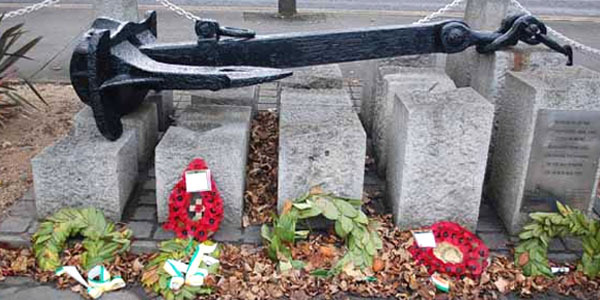 The biggest sea tragedy in Irish history was commemorated in January 1996 when the then Minister of State at the Department of the Marine, Eamon Gilmore TD, unveiled a special memorial in Dún Laoghaire Harbour. The memorial was to the 501 people who lost their lives in 1918, when the RMS Leinster was torpedoed just outside Dún Laoghaire Harbour. On October 10, 1918 the Mailboat, “The RMS Leinster” sailed out of Dún Laoghaire with 685 people on board. 22 were post office workers sorting the mail; 70 were crew and the vast majority of the passengers were soldiers returning to the battlefields of World War I. (1). The 163 yard-long pier (fig 1) was completed in 1767. It gave shelter to the small local fishing fleet, and facilitated the import of coal from Swansea and South Wales, until it became known as the “Dry Pier” because of silt. The problem was not new to the area. 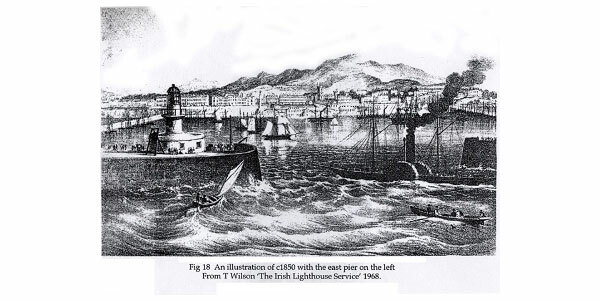 Since the late middle ages, Dublin Port became less accessible to vessels as a result of two factors – the growing deposits of sand at the mouth of the Liffey (evident in fig 2), and the common easterly gales. Wrecks were numerous, particularly between Sandycove Point and Blackrock. Dalkey Sound was a popular alternative refuge for deepwater vessels, and became known as the Dalkey Roads. A map of the same year (fig 3) includes the proposed Asylum Harbour, which compromised a single pier of 2,800ft. 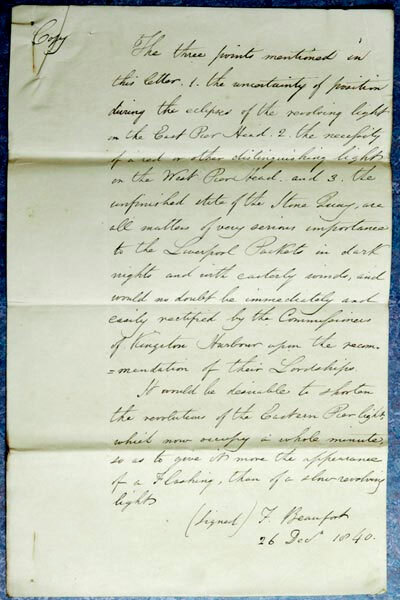 Captain Toutcher, the principal mover behind the concept, skillfully negotiated an agreement with several landowners in Dalkey, whereby the harbour contractor George Smyth could extract all the necessary granite from the Dalkey quarries, free of all costs. It is estimated that by the completion of the harbour in the 1850’s, this arrangement had saved the Government in the region of £240,000. The first stone of the pier was laid in ceremony by the Earl of Whitworth, then Lord Lieutenant of Ireland, in May 1817. 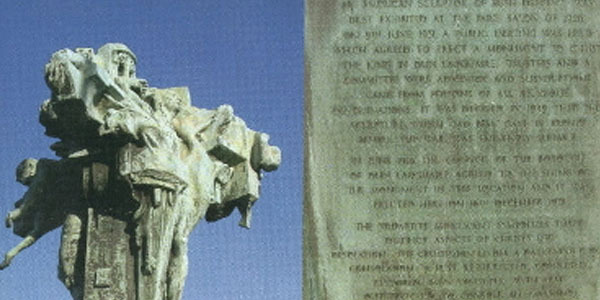 The stone was inscribed “In the hope that it may be the cause of life to the seamen, wealth to the citizens, Revenue to the Crown and benefit to the nation” (2). Work was far advanced when the renowned Scottish engineer John Rennie (1761-1821) was invited to assess the harbour design. Rennie (fig 4) was extensively employed by the British Government, and was responsible for numerous canals, bridges and harbours in the British Isles, including Waterloo Bridge, London Bridge and the Irish Royal Canal. Rennie proposed a second, western bridge which, along with an extended original pier, would force sand and deposits across the mouth of the harbour, and not into it (fig 5). Once accepted, this plan enlarged the scale and prestige of the undertaking. 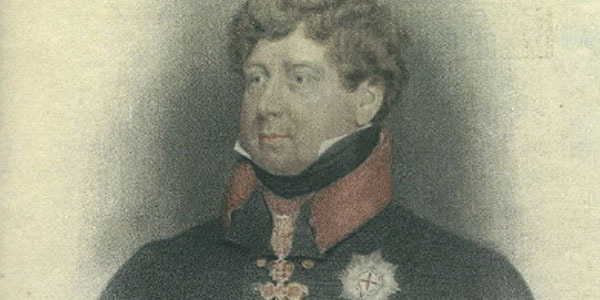 King George the Fourth embarked from Dúnleary after a three-week visit to Ireland, on 3 September 1821. Significantly, he bestowed the title ‘Royal Harbour of George the Fourth’, and the town was subsequently renamed ‘Kingstown’. “The foundation is laid at a depth of 20ft at low water, and for 14ft from the bottom the piers are formed of fine Runcorn sandstone, in blocks of fifty cubic feet perfectly square; and from 6ft below water mark to the coping, of granite of excellent quality found in the neighbourhood. They are 310ft broad at the base, and 53ft on the summit; towards the harbour they are faced with a perpendicular wall of heavy rubble-stone, and towards the sea with hugh blocks of granite sloping towards the top in an angle of ten or twelve degrees. A quay, 40ft wide, is continued along the piers, protected on the sea side by a strong parapet nine feet high.” (3). A two-man diving bell designed by Rennie and costing £975 facilitated the arrangement of the foundation stones, and “so fast was the granite poured into the sea that the East Pier is said to have progressed at the rate of 100ft a month” (4). Metal rails from the quarries of Dalkey, to the building site brought hundreds of tons of granite daily. In the 1820’s, the City of Dublin Steampacket Company, and the Government mail service both made Kingstown their Irish mail terminus. 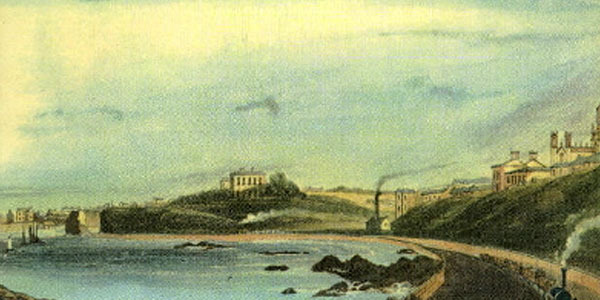 The opening of Ireland’s first railway linking Westland Row and Kingstown harbour ensured the growth of Kingstown as a social and commercial success. The population multiplied rapidly, reaching 25,000 in 1861, “composed chiefly of private families, professional gentlemen, wealthy and influential merchants”.(5). When the Irish Board of Works was established in 1831, one of its many responsibilities was the completion of Kingstown harbour. Work had halted while a debate over the size of the harbour mouth and shape of the pierheads continued. John Rennie’s scheme proposed a mouth of only 450 feet, and pierheads with short jetties (fig 7). The Admiralty’s view was that considering the prevailing easterly winds, such an entrance was too narrow for safe entry, thus defeating the harbour’s purpose. William Cubitt suggested a wider entrance, and a breakwater 1200 feet outside the mouth, parallel to the shore. A Mr. Walker, another engineer, proposed extending the East and West piers (at the time 3,500 ft and 4,950 ft respectively), making an entrance 650 feet wide, preventing the formation of a sand bar. In their annual report of 1836, it was felt by the Commissioners of Public Works; “At all events, much embarrassment in proceeding, and some unnecessary expenditure, will by the consequence of further delay in this matter” (6). A compromise was reached, whereby the piers were terminated at their present position, making the harbour mouth 750 feet wide. The History of the City of Dublin, 1820’s. Page 1276. P. Pearson Dún Laoghaire-Kingstown ISBN 0905140834 (Dublin 1981). Page 24. Lewis S – ‘Topographical Dictionary of Ireland’ 1832. Reprint Kennikat Press NYC 1970 ISBN: 0806310634 . Page 226. Ball FE – ‘A History of the County of Dublin’ 1902 HSP Library, Dublin, 1995. Page 34. Heffernan DE – ‘Heffernan’s Handbook of Dublin’, McGlashan & Gill, Dublin 1861. Page 2. Annual Reports of the Commissioners of Public Works. 1836. Probably dating to the eighteenth century, a military battery on the site of the present Dún Laoghaire baths became the subject of a letter from the Commissioners of Public Works in Ireland to the Board of Ordnance in London, in August 1842; “The Commissioners beg at the same time to suggest, that as this battery (No. 12) is in a state of complete dilapidation; that from its position, it is clear that it will never be used again as a means of defence, while such very superior situations are available on either side, such as the heads of the piers and Sandy Cove Point; and as it is rather an obstruction, the Board [of Ordnance] might perhaps not be averse to disposing of the entire property” (8). As is evident from fig. 34, this Glasthule Battery No. 12 was no longer strategically placed since the construction of the harbour. In a vignette to his Map of the County of Dublin of 1821 (fig 35), William Dúncan shows a scene of Kingstown. In the foreground is a Martello tower marked “No. 12” in the previous illustration, and the small walled compound marked, probable indicates Glasthule Battery No. 12, the predecessor of the East Pier Batter. 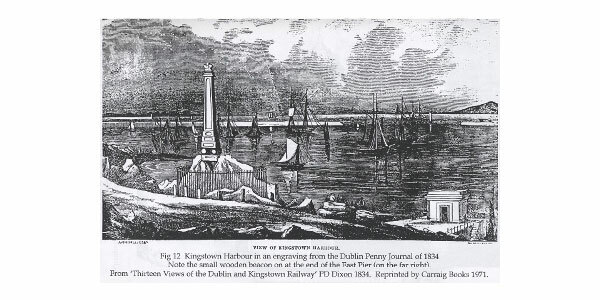 The following year (1843) it was demolished to make way for an extension of the Dublin-Kingstown railway line which was built as far as Dalkey. Government, it appears, have come to the determination of erecting defences for the protection of Kingstown harbour, for which purpose a circular battery is to be constructed on the east pier-head, armed with 68-pounders. The battery is to be commenced forthwith, and will be completed in about a year. By this means opportune employment will be given to the working classes during the winter months. (9). The ground plan of the battery as built can be seen in a drawing entitled ‘Proposed Kingstown Battery on the East Pier Head’ (National Archives OPW 5HC/4/951) figs 37 & 38. A barrel-vaulted passage leads from the pier to the terreplein of the batter (ie the ground level). Fig 39. Immediately to the right are steps into a ‘Shifting Room’ with two rooms off it marked ‘Magazines’ (fig 40). Ammunition was stored in the magazines, prepared for use in the shifting room, and could be lifted to the upper battery by the derrick above the doorway (see figs 40 & 41). Beside the Magazines, and continuing anti-clockwise, is the ‘Casemate’ (fig 42 & 43). 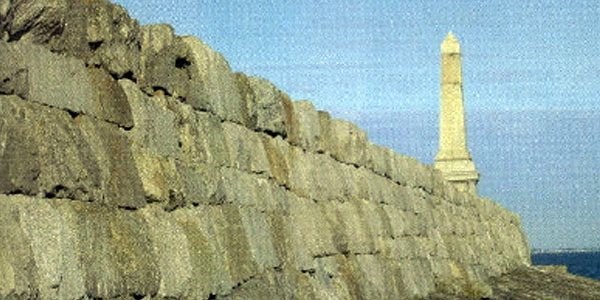 A casemate is a vaulted chamber of masonry (fig 44) within the ramparts, in this case for defensive purposes, since it is equipped with an artillery embrasure overlooking the sea (figs 45,46 & 47). Next to the casemate is the ‘Filling Room and Expense Shell Store’ (figs 48, 49 & 50). The steps, part of which form the lintel of the filling room, lead to the upper battery with three gun platforms (clear in fig. 38). On the lower battery were three more platforms, now only two (figs 51 & 52). The Artillery Store and Expense Magazine are directly opposite the battery’s vaulted entrance; two small rooms below the level of the terreplein (figs 53, 54, 55 & 56). Adjoining the Officer’s and soldier’s waterclosets (figs 57 & 58), are the soldier’s quarters (fig 57), designed to accommodate 24 men (figs 59 & 60). Outside is the water tank with a capacity of 3,000 gallons (fig 61). At this south-eastern corner was the cook house, coal store, and ash pit, evident in fig. 38. The landing stage (fig 62) ran behind the officer’s quarter and into the guard room (fits 38,63 & 64). CIL made alterations and repairs to areas of the battery in 1950, particularly the corner between the soldier’s quarters and the officer’s quarter (fig 65). “Round the lighthouse has been lately built Kingstown Fort, a small but powerful defence should an enemy show himself within range. From its prominent position it commands the whole bay; it is completely manned, has many guns of large calibre, a powerful magazine, and a means of heating balls to a white heat. The walls round it are curved at the tops, so that any balls striking them, would glance away harmlessly.” (10). The shot furnace mentioned is not evident in either the ‘Proposal’ drawing of 1857 (OPW 5HC/4/951), or the more reliable drawing’ as executed’ of 1861 (Dept. of Marine). However the War Office map of Kingstown harbour East Pierhead of 1862 (corrected 1883) marks “Shote Furnace and Passage” (fig. 66). The ‘passage’ is presumably joining the landing steps to the entrance passage, with the area off the ‘passage’ being the ‘Shot Furnace’. Later maps omit the furnace eg. 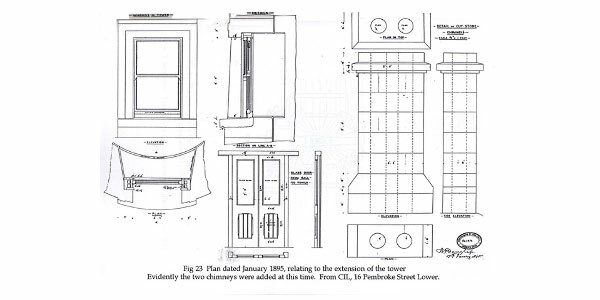 Fig 42; suggesting that it had been blocked up. Gun shot would be heated in a furnace, taking over an hour on average to reach ‘white heat’. 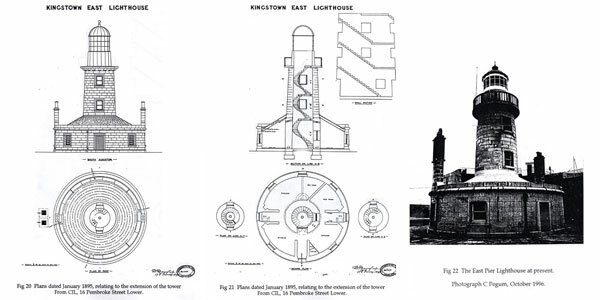 Figs 67, 68 & 69 explain a shot furnace design of 1843, built in a fortification in Malta. Essentially, the cold shot was inserted at ‘a’, this particular model holding a maximum of 63 balls. The fire was in the area marked ‘k’, which obviously only heated to ‘red’ or ‘white’ heat (as desired) those shot immediately over the flames. Three small doors (‘f’), when opened, allowed one shot each to roll onto the stone trough (‘i’) ready to be loaded and fired. The results of trials with this model (figs 67-69) stated; “after 61 minutes from the lighting of the fire, the foremost shot were ‘white heat’, and blazed instantly in a block of red pine..This furnace, after 70 minutes from the first lighting of the fire, furnished shot at intervals of 40 seconds (ie three shots in two minutes) all of which were of the same white heat” (11). (10) GR Powell ‘Official Railway Handbook to Bray, Kingstown, and the Coast’ 1860. P.52. (11) H Straith ‘Treatise of Fortifications and Artillery’ 1850. P. 728. (12) Colonel Chesney ‘ Observations on the Past and Present State’ P. 417 / 8. The three 68-pounder guns on the upper battery are visible in a turn-of-the-century photograph of the structure (fig 71). 68-pounder guns were not of one model, but usually adaptations, even ‘experiments’. The heavy ordnance of these guns suited their position facing out to the horizon; “These heavy calibres, with solid and even with hollow shot, command a considerable range, with an accuracy of fire perfectly astonishing” (13) and “The objects against which the guns of coast batteries are employed being generally movable, very great accuracy and rapidity of fire are essential” (14). On the lower battery were three 32-pounders (see fig 72,73 & 74). As mentioned, another 32-pounder was in the casemate (figs 47 & 75). On the terreplain are two arched gun embrasures. The ‘Proposal’ drawing of 1857 indicates only one (fig 38), but since this was altered to two by the time of construction, one can assume that there were 2 x 24-pounder guns which overlooked the harbour. Smalled splayed embrasures allo in this part of the parapaet (fig 76) would have facilitated short-range rifle fire into the harbour. Incidentally, the 24-pounder gun at the base o the East Pier (fig 77) is Russian, not English, and has no connection with this battery. Finally, a word about the platforms for these large-calibre guns. The 2 x 24-pounders on the terreplein, and very likely the 32-pounder in the casemate, were resting on ‘garrison carriages’, such as fig 78. Inevitably the discharge of the shot will force the carriage to jerk away from the direction of fire, after which it was rolled back to its original position for the next shot. No other mobility was possible, or necessary when firing through an embrasure. However, the six other guns were mounted on dwarf traversing platforms with rear pivots (figs 79,80,81 & 82) “Where rapidity of fire is not needed, the common ground platform of wood or stone may be used; but for quick firing at vessels in motion, the dwarf traversing platform is the more suitable” (15). Tow hollow-soled trucks run on the iron racers, allowing virtually a 180 degree range as well as a choice of elevation (fig 83). (13) H. Straith “Treatise on Fortification and Artiller” 1850. Page 692. (14) Colonel Chesney “Observations on the Past and Present state of Fire-arms” 1852. Page 417. (15) Colonel Chesney “Observations on the Past an Present state of Fire-arms” 1852. Page 417. “There was not stir about the harbour until about 8 o’clock, when a Royal Salute was fired from the East Pier Battery by a company of the Royal Dublin Garrison Artillery. At the sound of the opening gun every ship in the harbour dressed rainbow fashion as well as the big cruisers in the bay. The sudden burst of colours in the sunshine was a remarkable sight, with the loud booming of the guns, made a right Royal show of welcome to our King and Queen” (17). 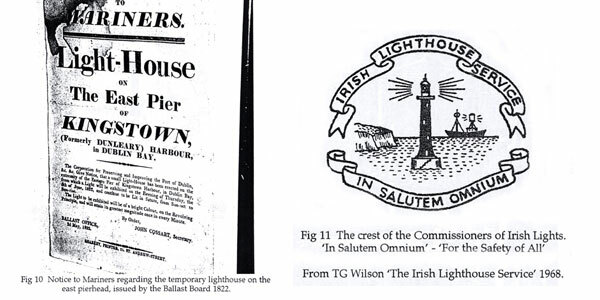 “The Irish Lights Commissioners control the lighthouse and hold accommodation at the battery for which they pay us £6.1s. per annum..” (18). Another interesting memo of 1948 reads; “James Harris was placed in the quarters by the British War Office. He was employed by the Bd. [Board of Works?] as a labourer from 1891 to 1920 when he was appointed caretaker of the Battery. His services were dispensed within 1933, but he was allowed to remain on a tenant in view of his advanced age” (19). (16) ‘Kingstown Directory and Guide’, T. Coall & Son, 1905. (17) The Irish Times, 11 July 1907. Page 7. 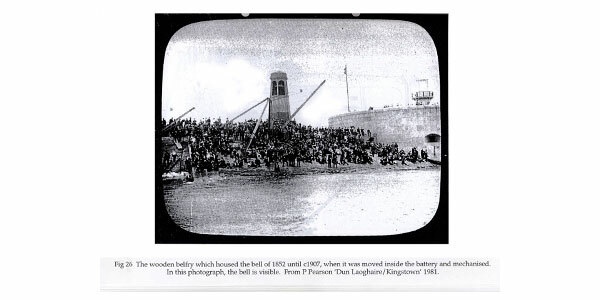 As the East Pier took shape, a wooden beacon was placed at its extremity to warn shipping, and moved away from the shore as work progressed (fig 10). The Corporation for Improving and Preserving the Port of Dublin (est. 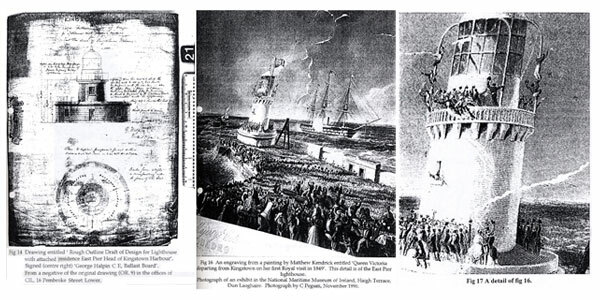 1786) also known as the Ballast Board, had assumed the responsibility for lighting the Irish coast in 1810. Later, these two functions were separated, when the Commissioners of Irish Lights (CIL) were established in 1854 (fig 11). 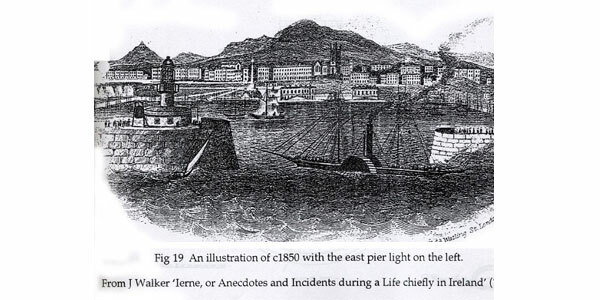 The small lantern (on the end of the east pier while the pierheads were being discussed) can be seen in an engraving of 1834 from the Dublin Penny Journal (fig 12). In the Commissioners of Public Works Report of 1845 it is recorded “On the east pier-head the new lighthouse is considerable advanced, and will be completion the course of the coming season” (7). 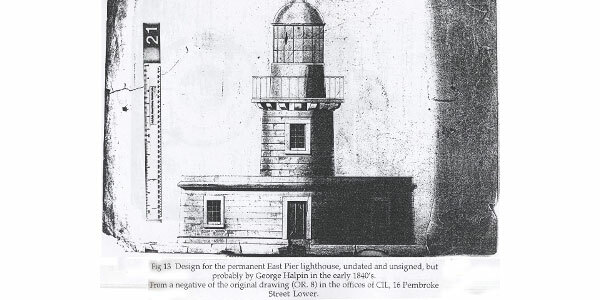 This permanent lighthouse and dwelling was designed by Chief Engineer with the Ballast Board, George Halpin, with some alterations by Jacob Owen (figs 13 & 14). The cost of the granite tower was £937, paid to the contractors. The light here was established on 1st October 1847, 41 feet above high water, and of 12,000 candle-power. Whereas Halpin’s plans show the ‘Draft’, a number of contemporary illustrations of c.1850 portray the executed model (figs 16 – 19). 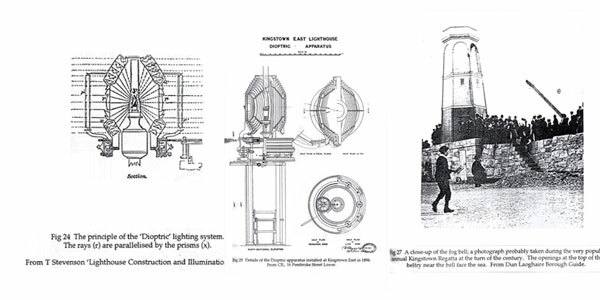 As early as 1877 the CIL received suggestions for improving the power and range of the Kingstown lights. In 1892, the City of Dublin Steam Packet Company, which had a monopoly on the Holyhead-Kingstown mail route, complained to the Commissioners of the poor harbour lighting. An Inspection Committee was established and alterations recommended. The tower on the east pier was heightened by 12 feet (figs 20-23), thus casting a beam on the Mugglin rocks off Dalkey for the first time. The ‘dioptric’ lighting system was installed, which involves the refraction of light rays from a source (an oil wick lamp), using glass prisms, so that they are parallelised and aimed at the horizon (ie the approaching mariner) (figs 24 & 25). The fog bell seen in Fig. 19 was replaced in September 1852 by a tall wooden belfry (figs 26 & 27) with a new bell inscribed SHERIDAN DUBLIN MAKER 1852. This manually operated device was succeeded by a reed horn, the firing of a gun, and a mechanised bell (from 1907). More cheerfully, Liam Byrne makes mention in his chapter on Irish airlines (suprisingly, there have been more than 20 of them over the past half-century) of the Short Sandringham flying-boat which this country saw ploughing its dignified path on the Shannon some years ago. 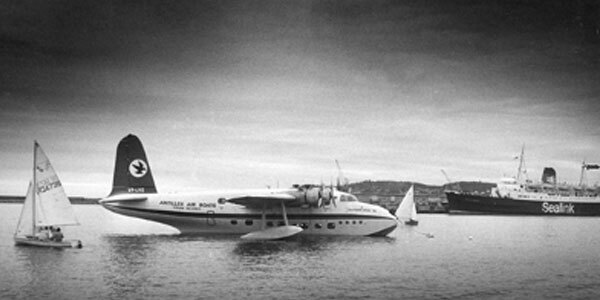 The 48-seater, built in 1943 by Short Brothers in Britain as an RAF Sunderland, was converted to civilian use by the same firm in Belfast four years later. After a journey through several owners, it was purchased in 1974 by an American aviator Captain Charles Blair, owner of Antilles Air Boats in the Virgin Islands and husband of Maureen O’Hara, the actress. It was the innovative Aer Arann that brought the vintage craft to Ireland when the firm hired it for the summers of 1976 and ’77. Blair sadly died two years ago when another seaplane piloted by him, a Grumman Goose, crashed intp the sea off the Virgins. 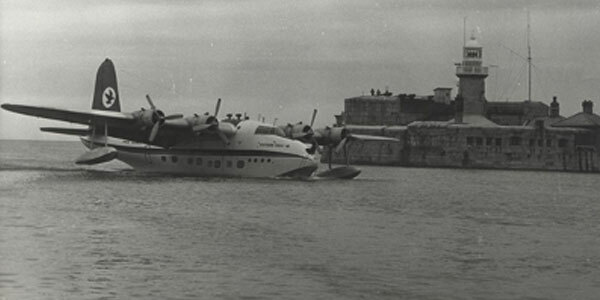 The new owners of his company are not interested in keeping the Sandringham, almost certainly the last remaining British-built large passenger flying-boat on their books. A Dorset aviation firm nows seems to have seized its chance and has virtually raised the money to buy it with the intention of bringing it back to England, overhauling it and eventually putting it on display. One of the main movers behind the scheme, Michael Coughlin, told the Diary yesterday: “We’re almost there at the buying end. We’ll know by Thursday, I’m flying out to the Virgin Islands to pay over the rest of the money”. From an Irish point of view, the next stage of the scheme could well see the flying boat on the Shannon again. Coughlin and the company hope to use the Southern Cross, when overhaled for ‘joy rides’, a few seasons of fun and nostalgia before permanent display. “We’ll certainly be bringing it back to Ireland”, he said, “We hope to be visiting you very soon”. He and his fellow-organisers have now appealed for help to the original makers, Shorts. It would indeed be appropiate if the Belfast firm contributed to the effort to restore its fine old warhorse. This is an “Irish Press” photograph of what must be one of the more unusual visitors to Dun Laoghaire in recent times, Sandringham Flying Boat VPLVE, “Southern Cross” owned by Antilles Air Boats of the U.S.Virgin Islands * commanded by Capt. Charles F Blair. The aircraft may be coming to Ireland again in the summer of 1979. This booklet looks at a small aspect our heritage. The public memorials of the county are a discreet part of our cultural heritage but they are important physical reminders of what are often intangible aspects of our identity. 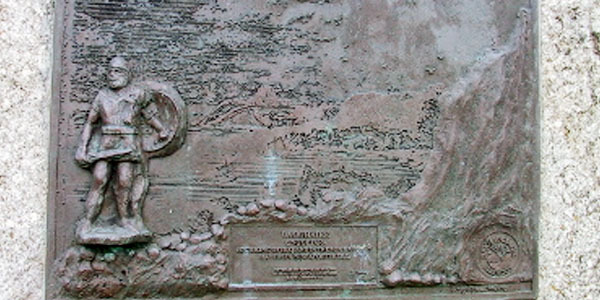 The booklet deals for the most part with memorials to those who have achieved great things in their lives and through a plaque or piece of sculpture are given public recognition for those works. The range of people is bewilderingly eclectic. There are a considerable number of these but, given the people who have lived in the county in recent centuries, the number is perhaps surprisingly low Maybe as a county we should look to develop a policy around recognising the achievements of our citizens. A large part of the other memorials are personal ones. These are usually in the form of trees and benches in public parks or roadside memorials. These are dealt with in a pull out section and maybe there could have been more made of them. However, this would have been impractical given the lack of details dealing with many of them. None-the-less there are obviously powerful emotions and stories attached to each. The geographic spread of the memorials, primarily in the eastern part of the county, is not the result of any bias. It just reflects the fact that this is where there has been a longer history of population – primarily since the construction of the harbour at Dun Laoghaire. This population has also been perhaps the most significant population in terms of cultural influence. This booklet claims to be a comprehensive list of public memorials but it is not definitive. Just when I thought I was done I would pass another plaque on a house! There are definitely memorials that have been missed. Please let us know if you know of ones that have not been included. Should this booklet be reprinted they will be included. 2009 is the 175th anniversary of the first scheduled steam train service to convey passengers in Ireland. Though giving the impression of a national rail network in Ireland might be a bit too grandiose an image. The line ran from Dublin to Kingstown (Dun Laoghaire) and back and fortunately this line survives today, even surviving the ‘efficency experts’ that killed off most of Ireland’s rail system. Charles Blacker Vignoles is regarded as one of the great engineers of the nineteenth century. He was born in Woodbrook, County Wexford in 1793. Orphaned at a young age he moved to England where he studied Mathematics and Law, He joined the army in 1814 and served under the Duke of Wellington. After returning to England Vignoles embarked on an engineering career that would see him become one of the world’s leading engineers. One of his first contracts was with the St Helens & Runcorn Railway in 1830-1833. As a result of his experience in England Vignoles worked with William Dargan on the Dublin-Kingtown Railway. 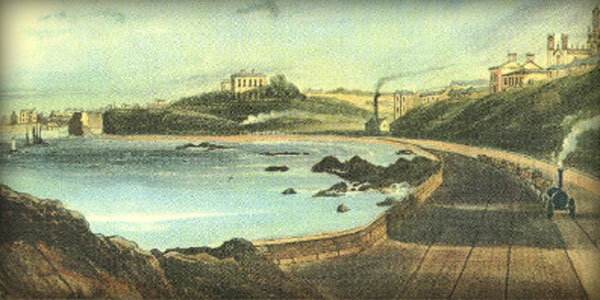 Opened in 1834 it was Ireland’s first railway. Vignoles was also responsible for the design of Westland Row station. Among Vignoles most important works are the Kiev Bridge over the River Dnieper in Russia and the Tudela and Bilbao Railway in Spain. He died in 1875. 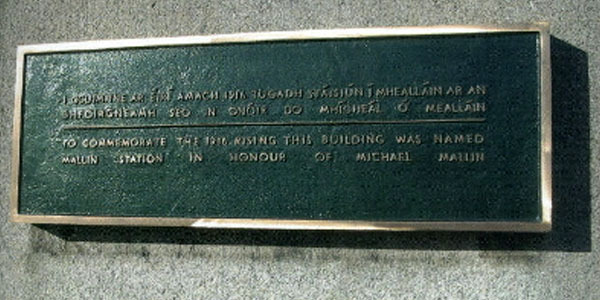 There is a plaque in his honour at Dun Laoghaire railway station. 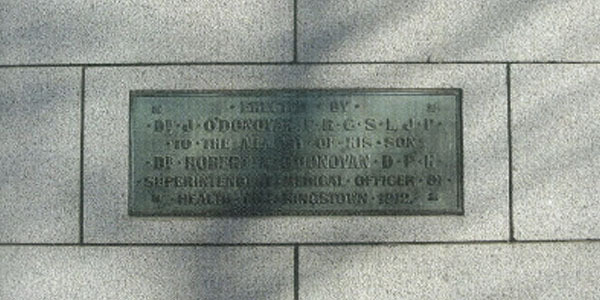 All images and descriptive text used with permission Dun Laoghaire – Rathdown County Council. 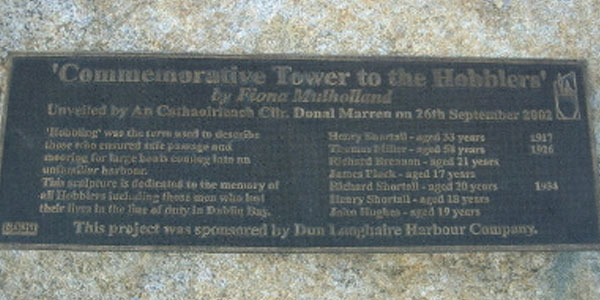 A book on the memorials of the county including this one has been published by Dun Laoghaire – Rathdown County Council.